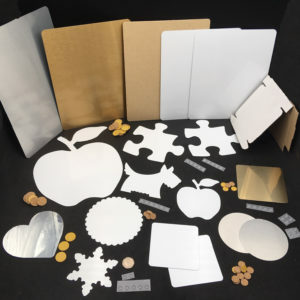 Our new Business/Wallet Card Starter Pack showcases a selection of our products from our huge range of products and metal types and finishes which are perfect for promoting your business. The majority of items come in white but other colours and finishes are also included so you can produce amazing samples or new items to sell. Business Cards: 0.5mm – 10 each of white and brushed silver, and 1 each of our other finishes. A fantastic introduction to the world of aluminium sublimation printing for promotional and business uses! Alternatively UPGRADE and add the Name Badge Starter Pack to create the ULTIMATE Name Badge and Business/Wallet Card Bumper Collection (click here) to see all these items together at an even greater discount – over £28 worth for £19.95. One pack per customer please. We reserve the right to substitute items of equal or greater value if required.